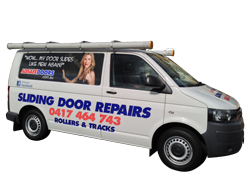 If there’s one thing that is quite common among Australians it’s slang, and of course, someone who repairs sliding doors is often referred to as a door fixer. When it comes to door fixers, we’re looking at a couple of different things. There’s a range of different doors that need to be fixed, so let’s go through a few of them here. Glass sliding door repairs are the most common. The glass sliding door repairs are usually the one that is in the front door of your house or maybe leading to the back area of your house. They are also balcony sliding doors that are glass. These are very commonly used, so as a result, they have a lot of wear and tear. They get a lot of use. Glass sliding doors get a lot of dirt and grime, and the rollers and tracks become brittle and start to disintegrate over time. We need to jump on that, make sure it’s fixed, otherwise, you’ll have an impossible to open sliding door. You won’t be able to open it, but what we can do is replace all of those with high-quality rollers, new tracks, and have your glass sliding door rolling like new. Now, another common door is an internal sliding door. These are the ones that might go from one room to the next. Maybe the living room to the lounge room or the kitchen to the TV room and that type of thing. They come in wooden doors. They can be beautiful wooden doors. They can be sliding glass doors, sliding wooden doors, and so on. The internal wooden doors also have a track. They also have a track and rollers that need to be tended to and maintained. As you can appreciate, all of these have constant wear and tear. Your door fixers (that’s us), are able to jump in there and will fix those doors. We’ll have a look at the rollers and the tracks and make sure that they are repaired and back to perfect working order. The other type of common door is the aluminium door. In fact, most homes have these going from the inside to the backyard and they are very common. They’re usually made of aluminium because they’re a little bit lightweight and they cost less than your steel frame doors and heavy wooden doors. Aluminium sliding doors are a little bit lighter, so not as much wear and tear on the tracks and rollers, but still, it’s wear and tear, and over time they’re going to disintegrate. It is inevitable that your tracks and rollers will break down over time. They’ll get dirty, broken, chipped and damaged and need to be replaced as well. Adsafe Doors has been a door fixer and a specialist door fixer for over 25 years, and we can look after all of your door repairs. No matter if it’s internal sliding doors, glass sliding doors or aluminium sliding doors, we can fix your door and will travel all across the greater Sydney area. From Bondi, over to the Northern Beaches, Parramatta down to Penrith, Blue Mountains, and The Hills District. So give our team a call today. We’ll provide a quote for your job and a timeframe to come and repair your sliding door.